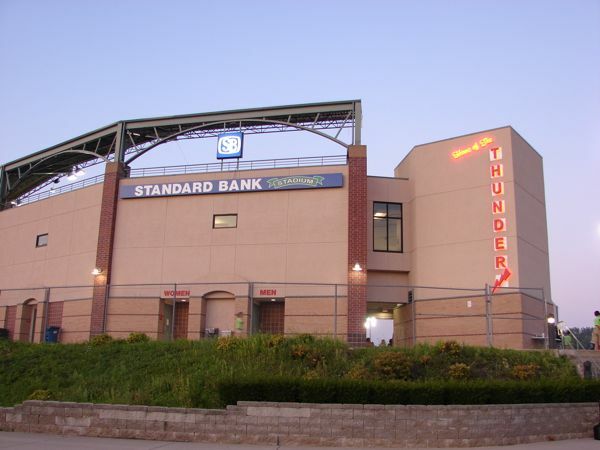 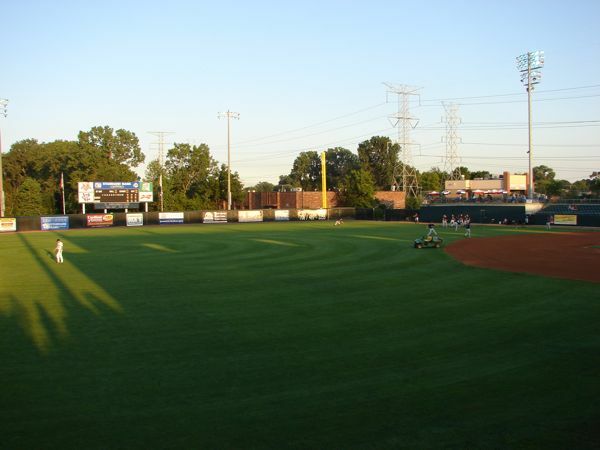 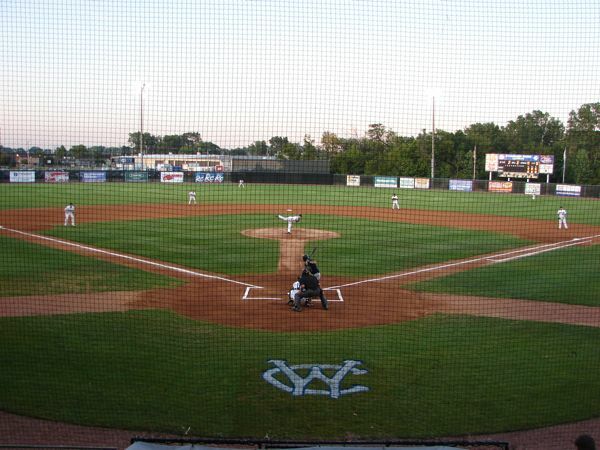 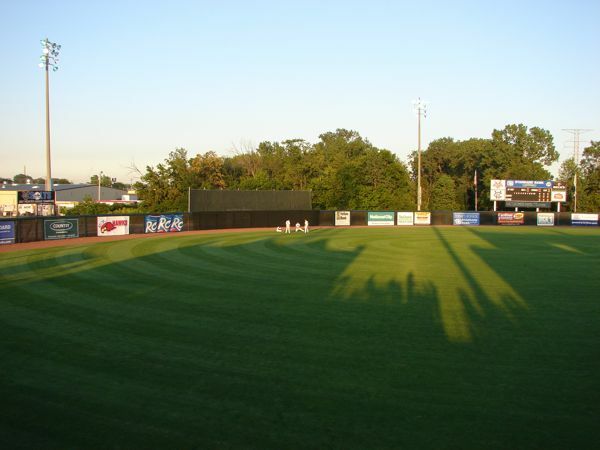 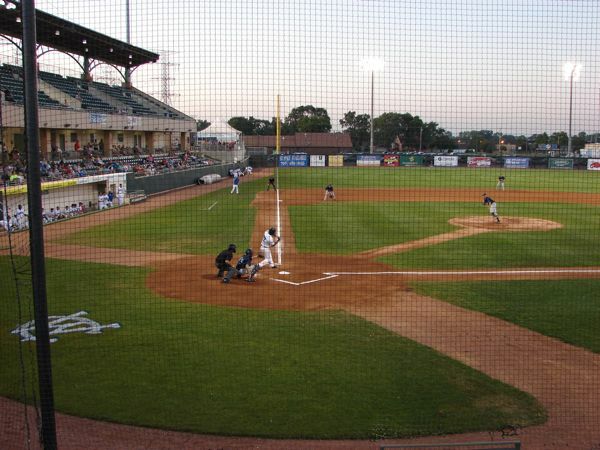 The Windy City Thunderbolts, a Frontier Independent League team, located in Crestwood, IL play at Standard Bank Stadium, built in 1999 and seating 3,400. 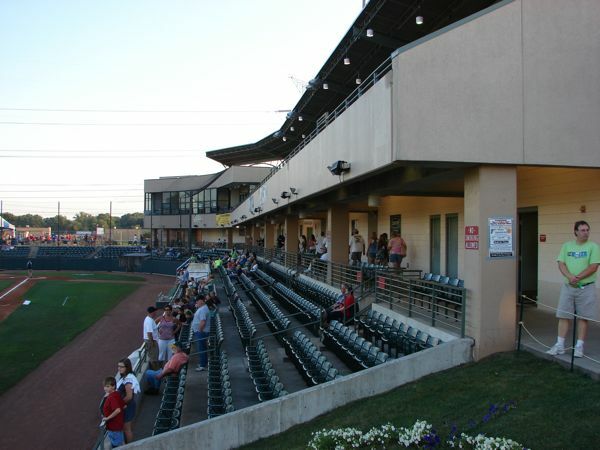 This stadium has two levels of seating on the third base line and two suites next to the broadcast area. 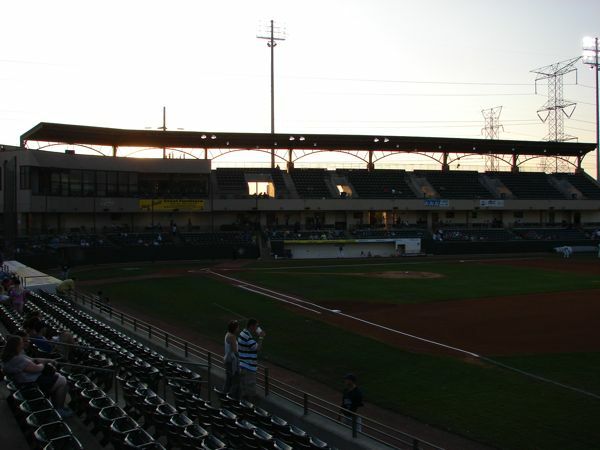 The first level seating is raised above the field about 8 feet. 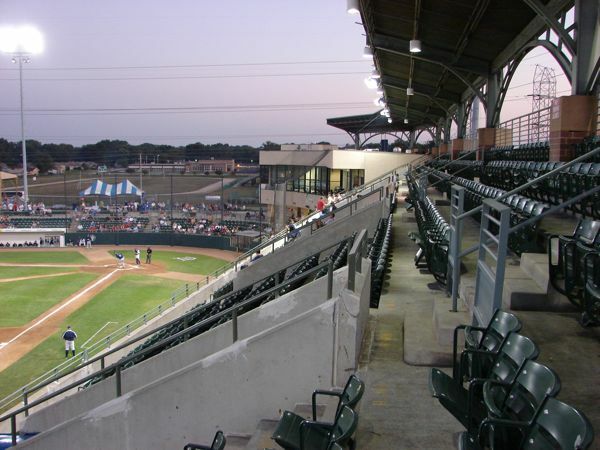 The lower level has 7 rows and the upper level has 11 rows. 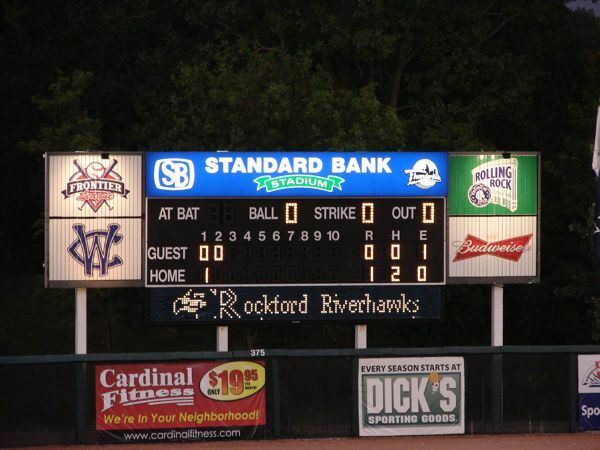 The Thunderbolts were playing the Rockford RiverHawks and won a shut-out 7-0. 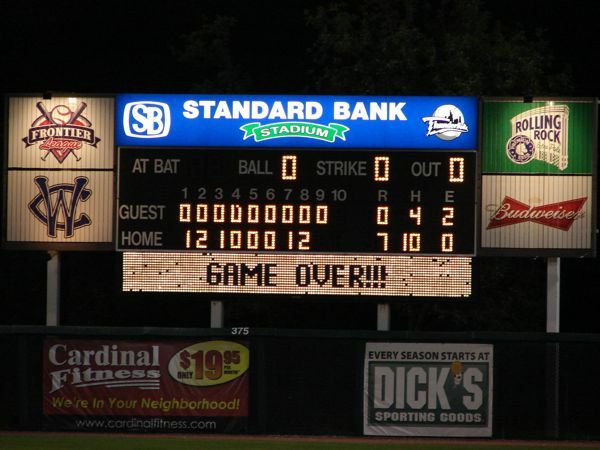 The box score was RiverHawks R-0, H-4, E-2 and the Thunderbolts R-7, H-10, E-0. 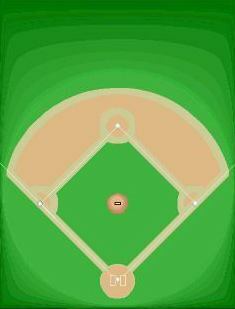 The field lines are RF-330', RC-375', LC-375', LF-330'. 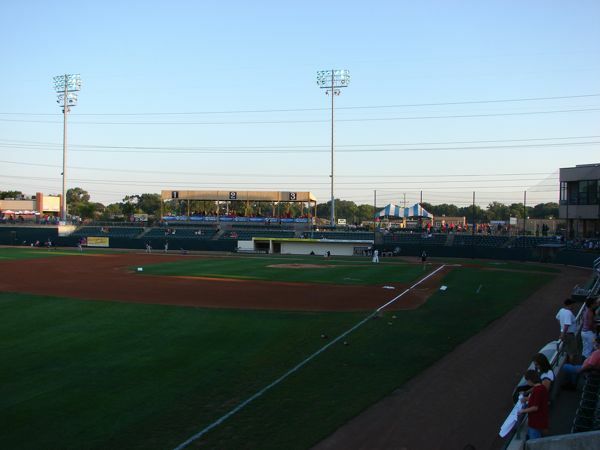 The Thunderbolts won the Frontier League Championship in 2007. 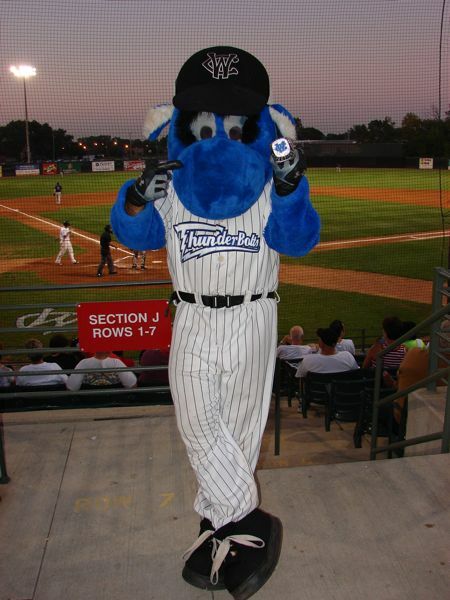 The mascot is Boomer and he is holding a replica of the ring the players received as Champions. 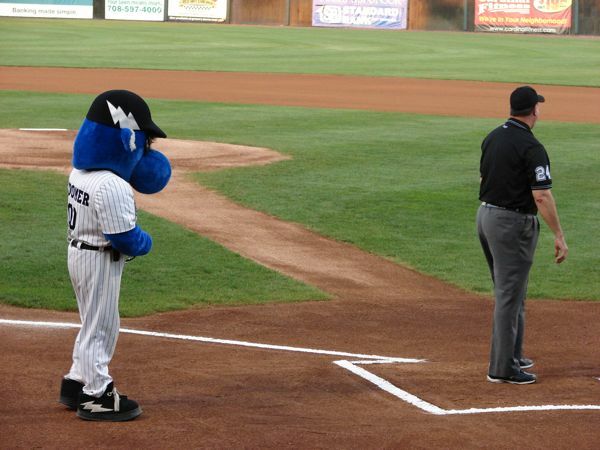 Before the game started Boomer offered the homeplate umpire a pair of glasses. 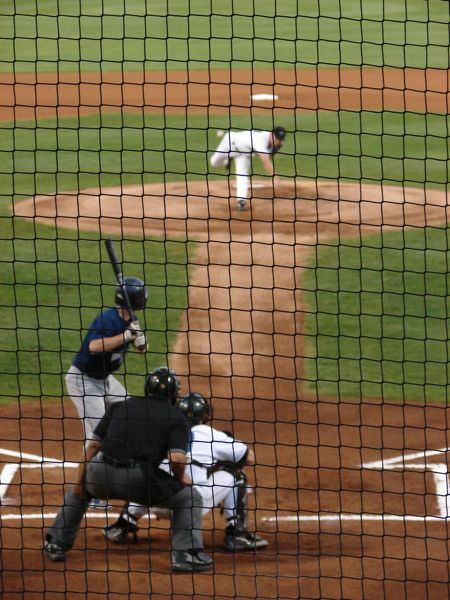 The fans thought he needed them on a couple of calls. 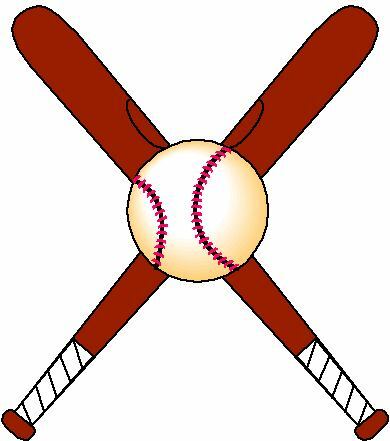 New between inning activity--Dizzy Golf Club race-spin around a large play type golf club then run down and hit a large sized golf ball. 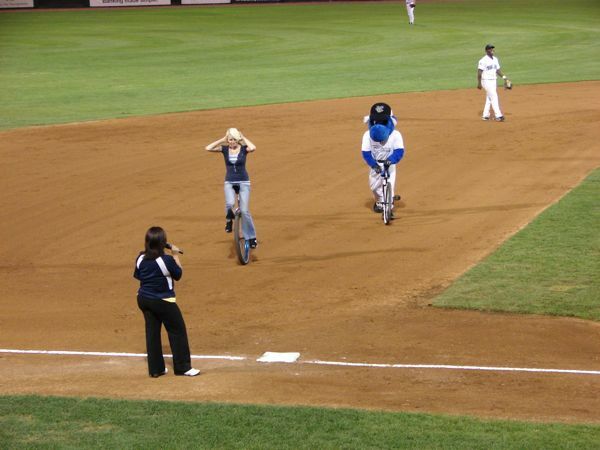 For the mascot race Boomer lost again, but that was because he didn't know how to ride a unicycle. 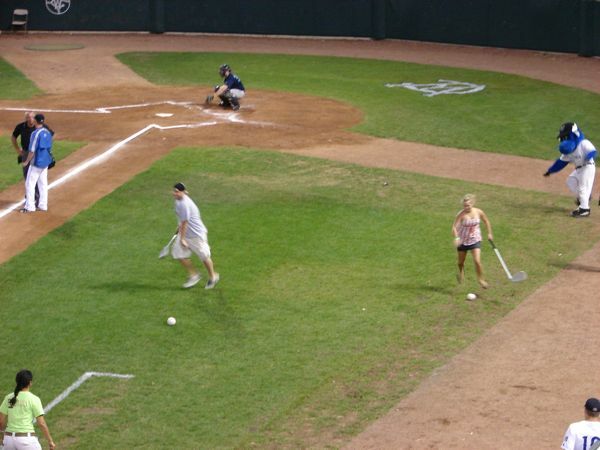 His competitor did a good job. 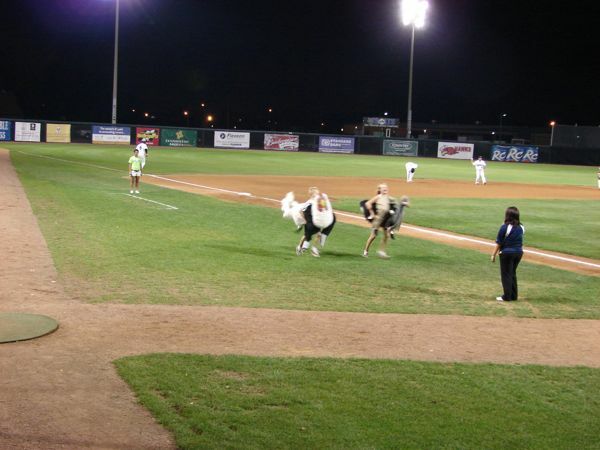 The animal race has one wearing an ostrich costume and the other a chicken costume who had to race from third base to a cone near home plate and back again. 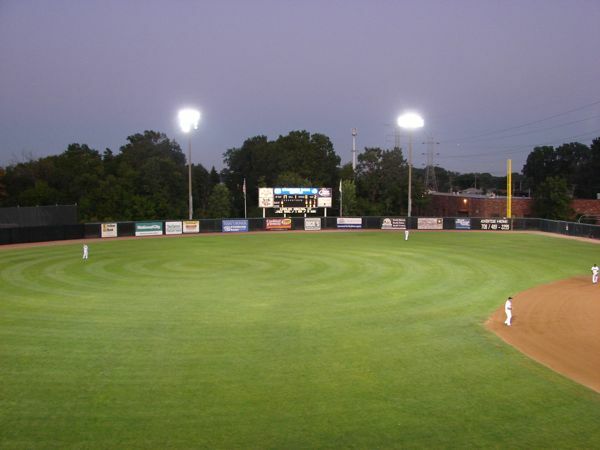 There is a group of guys who always stand around the light pole to the right of the picnic pavilion on the first base side. 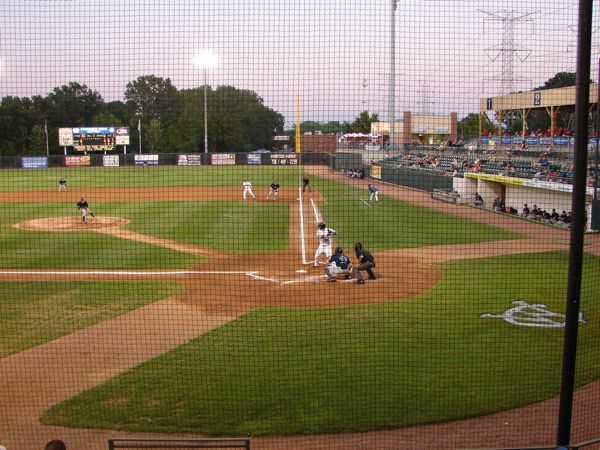 The Thunderbolts are in the play-offs again this year. 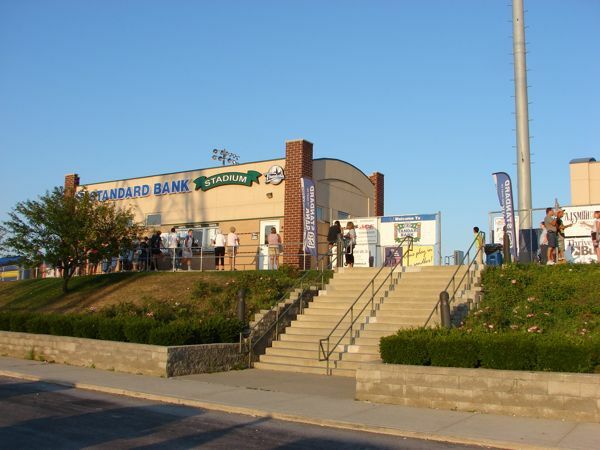 We sat behind two young couples who are big supporters of the team and had a great knowledge of all the play-off possibilities.